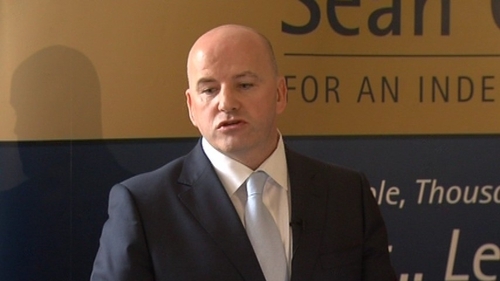 Independent candidate Seán Gallagher has received two official nominations to contest the Presidential election. Cork City Council will vote on officially nominating Mr Gallagher at their meeting next Monday. Mr Gallagher was among four people to address a special meeting of the City Council this evening seeking the support of councillors. Following the 90-minute meeting, the councillors voted to exercise their right to nominate a candidate and to put Sean Gallagher's name on the agenda for formal ratification next Monday night. 25 of the 31 City Councillors attended tonight's meeting. The successful motion to put Mr Gallagher forward was proposed by FF's Kenneth O'Flynn, and seconded by Independent Councillor Kieran McCarthy. Labour party members voted against the motion, and Fine Gael councillors abstained. The members of Meath County Council earlier voted to nominate Mr Gallagher, while Leitrim County Council this evening passed a motion to nominate him. He needs the backing of two more local authorities to contest the election. Mark O'Mahony, Richard McSweeney and Dermot Mulqueen also sought the support of Cork County Council in the race for the Áras. A decision on a nomination is due within a fortnight. Meanwhile, Independent candidate Mary Davis today received her second official nomination when Sligo County Council voted to back her. She secured her first official nomination last Friday when Galway County Council voted to support her. Fine Gael MEP Gay Mitchell and Labour's Michael D Higgins are the two nominated candidates already in the race. Sinn Féin has still not made any decision on who it will support for the Presidency, while Fianna Fáil last week decided it would not run an internal candidate in this year's election.